Noah Hand Hand Signed and Numbered Canvas Giclee:"Top Hat and Tails"
Edition / Medium: Artist Hand Signed and Numbered Limited edition to 195 with COA. / Canvas Giclee. 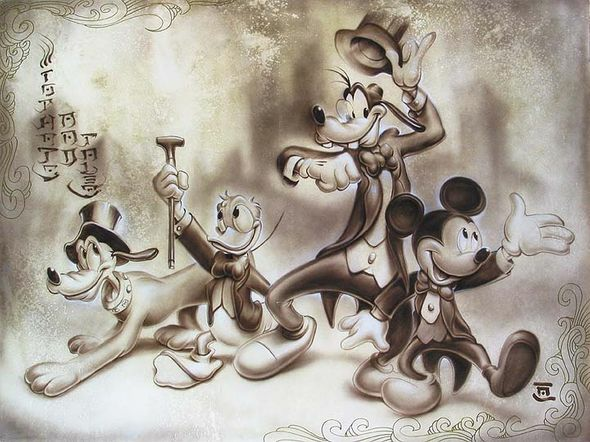 About the Artist: Noah's original Disney character portraits, crafted in his signature Asian-influenced, monochromatic paint style, are proving to be extremely popular among collectors of Disney Fine Art. He carefully renders the composition first, and then over-paints with more exuberant effects. "I like to mix photorealism with drips and texture. It contradicts itself and works to the very end the organic and natural contrasts beautifully with the structure of the airbrush and photorealism. It's a nice marriage of techniques that gives the work more depth. The effect is almost trompe - l'oeil, French for 'trick the eye', which is an art technique involving extremely realistic imagery in order to create the optical illusion that the depicted objects appear in three-dimensions. This is especially true of the water drops on the flowers."